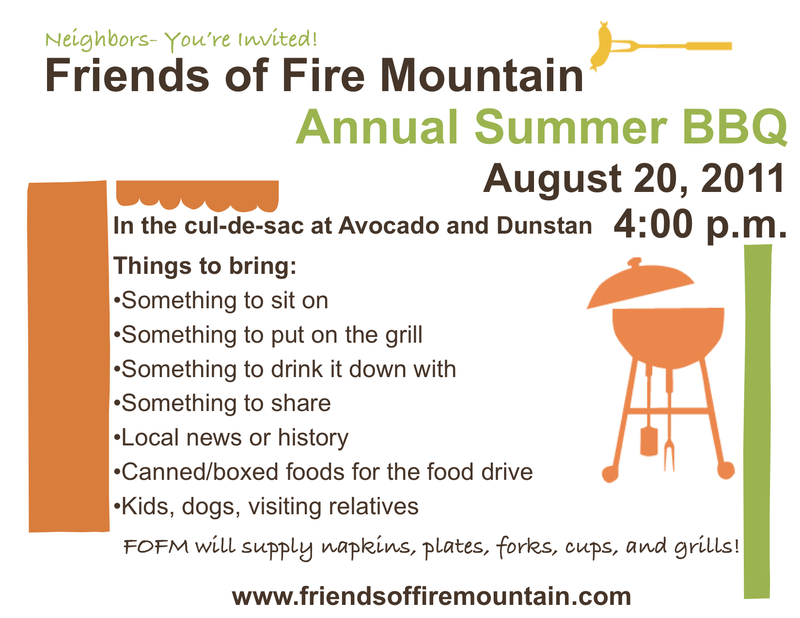 Don’t miss the annual end of summer BBQ with Friends of Fire Mountain! On August 20th at 4:00 p.m. join your neighbors at the cul-de-sac at the end of Avocado on Dunstan. You’ll see flyers posted in the neighborhood as reminders to bring a little something for the grill, a dish to share, something to drink, something to sit on and a canned/boxed food item for the food drive. Kids, dogs, and visiting friends and relatives are welcome! FOFM will provide the plates, forks, napkins, cups and of course, the grills. Categories: Events, Meetings and Events | Permalink.